Nowadays it's hardly ever the case that your job will consist of only one kind of tasks. Any job will have an element of planning, designing and creating a product, will involve some degree of marketing it, providing support for clients, doing research on future developments and on top of this there is the financial set-up, managing your work force, and lots more. Add to this mix the fact, that each of your colleagues faces this same, exact problem - juggling tasks and getting overwhelmed. So - what you could possibly benefit from is a visual management tool - an application, that will make your job easier to handle. By placing your different tasks in ordered columns and deciding on the progression with which you'll be taking care of the tasks, you will quickly gain more control over your workflow. You will also streamline the company process and greatly increase productivity. 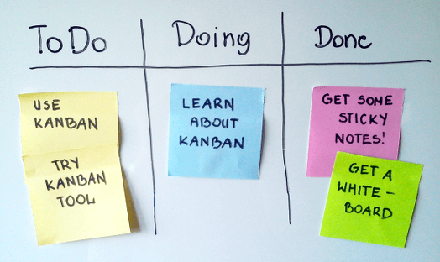 Try the easy and effective way to manage your tasks visually - Kanban Tool. With this online application, you only need to follow two rules - implement visualization: by splitting all your tasks into items as small as possible, and placing them all on the Kanban board - and apply a work in progress limit: decide on a maximum number of items that you and your team members want to be working on at any given time. What will you gain from Kanban Visual Management? 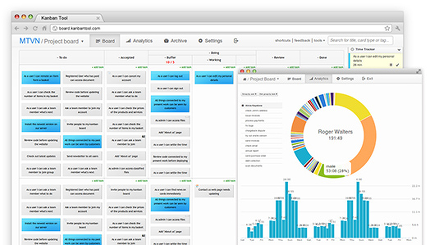 Kanban boards provide a wide range of insightful analytics, metrics and reports, that will help you track, visualize and manage projects like never before.